Teething is a monumental phase every baby goes through. No doubt you will cherish these growing-up moments. You’ve also probably thought about various remedies that might ease your baby’s pain during teething. 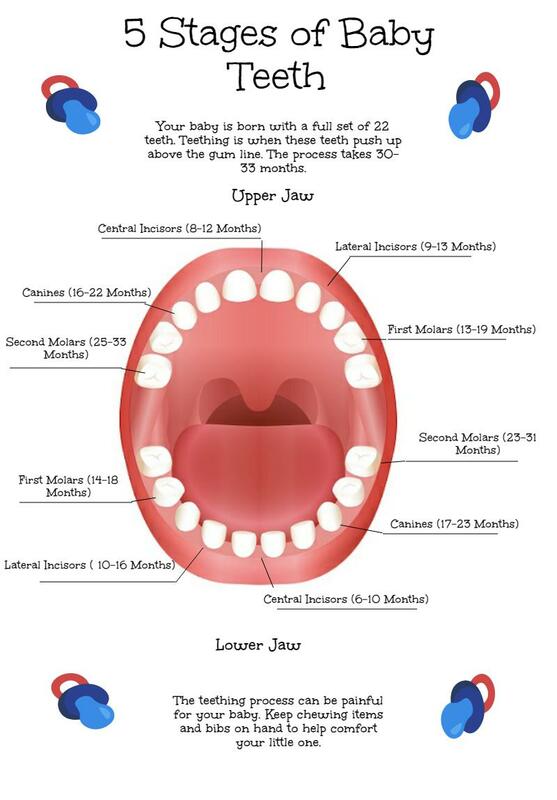 If you’re expecting a baby or have a newborn and are wondering when to start planning for the teething phase, the following infographic of the five stages of baby teeth is a handy, quick reference. By the time your baby is 33 months old, all the baby teeth should have appeared. It is important to note that your baby will come into the world with a full set of 22 teeth already. These teeth can’t be seen as they are below the gum line. Teething is when these teeth grow up from the gum and become visible and functional. The teeth on the bottom come in a little before the teeth on the top do. There are five stages your baby will go through during the teething process. The front, central incisors are the first to appear, usually in as little as 6 months. This is the first stage of teething. The lateral incisors come in next, followed by the canines (the second and third stages). The molars are the last teeth to appear, coming in at around 13 months. The first molars (stage 4) come in before the second molars, which come in last (stage 5). Similar to the order in which they come in is the order your child’s teeth will come out (so they can be replaced with adult teeth). There will be around a three-year span between when your baby’s teeth are completely filled in and when the baby teeth begin to fall out during childhood.